Russian political economist; born 1864. After graduating in law from the University of St. Petersburg, he was commissioned (1887-90) by the minister of domains to investigate the economic life of the peasants in the governments of Tobolsk and Tomsk. In 1894 he made a study of the economic condition of the new settlers in a part of the government of Tomsk, and published his investigations under the title "Materialy dlya Isucheniya Ekonomicheskavo Byta Gosudarstvennykh Krestyan Zapadnoi Sibiri." Kaufman likewise contributed to, and edited, "Krestyanskoye Zemlepolzovaniye i Khozyaistvo v Tobolskoi i Tomskoi Guberniyakh" (St. Petersburg, 1894). 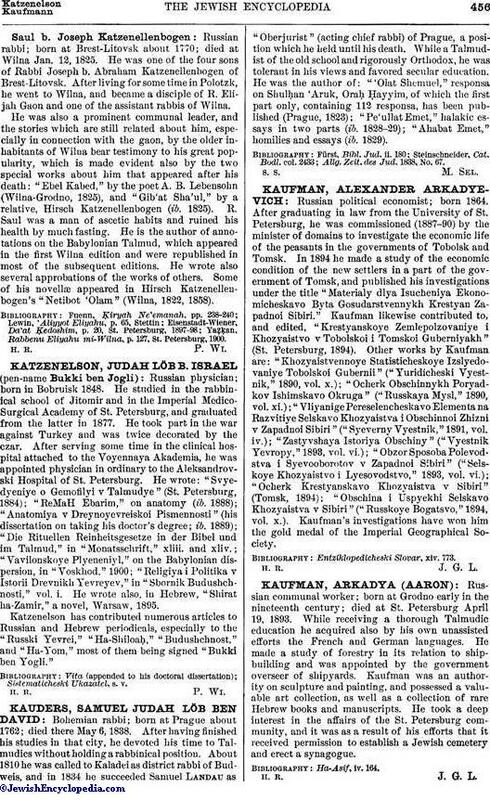 Other works by Kaufman are: "Khozyaistvennoye Statisticheskoye Izslyedovaniye Tobolskoi Gubernii" ("Yuridicheski Vyestnik," 1890, vol. x. ); "Ocherk Obschinnykh Poryadkov Ishimskavo Okruga" ("Russkaya Mysl," 1890, vol. xi. ); "Vliyanige Pereselencheskavo Elementa na Razvitiye Selskavo Khozyaistva i Obschinnoi Zhizni v Zapadnoi Sibiri" ("Syeverny Vyestnik," 1891, vol. iv. ); "Zastyvshaya Istoriya Obschiny" ("Vyestnik Yevropy," 1893, vol. vi. ); "Obzor Sposoba Polevodstva i Syevooborotov v Zapadnoi Sibiri" ("Selskoye Khozyaistvo i Lyesovodstvo," 1893, vol. vi. ); "Ocherk Krestyanskavo Khozyaistva v Sibiri" (Tomsk, 1894); "Obschina i Uspyekhi Selskavo Khozyaistva v Sibiri" ("Russkoye Bogatsvo," 1894, vol. x.). Kaufman's investigations have won him the gold medal of the Imperial Geographical Society.